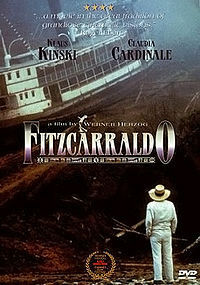 Fitzcarraldo is a 1982 film written and directed by Werner Herzog and starring Klaus Kinski as the title character. It portrays would-be rubber baron Brian Sweeney Fitzgerald, an Irishman called Fitzcarraldo in Peru, who has to pull a steamship over a steep hill in order to access a rich rubber territory. The film is derived from the real-life story of Peruvian rubber baron Carlos Fitzcarrald.